In preparation for the discussion of the Department of Public Work’s recommendations on spraying wild parsnip, I looked into the active ingredients and the variety of eradication methods. Councillor Dalgity also shared some Health Canada information about the product that he obtained. Online, I looked at many documents from sources charged with approval of pesticides such as Health Canada, the Ontario provincial government, the US Environmental Protection Agency, the European Union, and others that mentioned the active ingredients in Clearview. We heard from farmers, both those who use herbicides and organic, who invest a lot of money, time, and effort in their products and do not want them endangered. I received email from three people whose children were badly burned, and heard from a few others who suffered minor burns or had treated burns. Reference point: we are all required by law to eradicate noxious weeds under the Ontario Weed Control Act. After reading Ontario guides from different years, it looked to me like some plants are removed from their list and new ones are added. If a person has noxious weeds on their property, they could be ordered by a weed inspector to remove them. If they don’t, they will be removed anyway and the Municipality gets billed for the cost. The Municipality in turn recovers any cost on the property tax bill. Growing up in Manitoba with several big seed companies like McKenzie’s, that was not new to me. The Province mandates the eradication. The federal government and Province approve the herbicides. The product, Clearview, seems to be an improvement over older type herbicides which were much stronger, persisted longer and were more toxic to other life forms such as animals, insects, fish and humans. The earlier product recommended for Giant Hogweed and Wild Parnsip contained glycophates, which I understand are now in question. In the 2015 version of the Guide to Weed Control, a footnote said that test projects at the University of Guelph indicated that Clearview did well. Clearview is different in that it is not metabolized by anything but plants. Different things I read said that it dissipates quickly after spraying and will not remain for very long, except maybe in legumes like soybeans. Its minute application is very diluted with water. The active ingredients are Aminopyralid Potassium and Metsulfuron-methyl. While some claim that Clearview has not been tested, the active ingredients have. Both were tested by the United States Office of Prevention, Pesticides Environmental Protection and Toxic Substances division and reviewed by a joint Canadian-American panel. The European Union also reviews the various ingredients of herbicides. All this information is easily found online. It is not true that only Dow tested the ingredients; there were quite a range of tests by various companies and organizations including International Wildlife, as cited in the US Environmental Protection papers. The product instructions caution against repeated use to avoid plants building a resistance to it. If spraying is successful, Clearview should be needed less and less. This was borne out by recent City of Ottawa and Lanark County evaluations. It is a balancing act: spraying will kill some other beneficial broadleaf plants, which can be slow to come back. However, the invasive weeds are already crowding out natural plants and infesting agricultural fields, causing pollinators like bees to lose some of their preferred sources. Farmers keep bees like livestock. Failure to control weeds on municipal property adds to the burden on our agricultural producers. For the future, scientists are researching more specific and gentler herbicides but also insect predators that could be imported to prey on the wild parsnip. There was some success with importing two types of beetles from Europe to attack the purple loosestrife, although the beetles were reportedly picky about where they would work! Importing predators can be a double-edged sword if the insect predators then take on desirable plantlife. We might expect to see it in use on wild parsnip. The insects used are parsnip web worms. They would also be a foreign species so caution is in order. I read an article about how the wild parnsip in New Zealand “let down its defences” after being separated from its predator for 100 years. The result was that wild parsnip was pretty much wiped out very quickly. Dr Coupland alluded to this information. The North American parsnip may not be as vulnerable. I learned that even domestic parsnip can be irritating, although more mildly. I heard that there were 26 property-owners who opted out of spraying last year, and 20 of these controlled it on their own, by puling it out mostly. This year, concerned citizens can group together and Adopt-a-Road to eradicate the pest manually. Our Public Works can give you more information on opting out and adopting a road. If people insist that all herbicides be banned, or think that wild parsnip should not even be controlled, they might lobby the provincial and federal governments with their evidence. We can’t change those laws here. This Council was in favour of allowing opt-outs and encouraging Adopt-A-Road volunteers, but wants to be strictly vigilant in protecting people and animals from burns and agricultural resources, both traditional and organic, from invasive plants. We expect that the required conditions of spray application, such as buffers around water, will be strictly observed by the licensed operators. This is a balanced approach, tailored to local preferences, but keeping our Municipality absolutely within the law. We expect that those who opt out or adopt a road share this view. The good news is that we are witnessing the evolution of dealing with invasive species using methods, including herbicides, with the least amount of impact on non-targets that is reasonably available right now. We have witnessed this approach before, in medicine. Manufacturers and governments are changing, thanks to the concern of people like the delegates who cautioned against spraying. Because of their concerns, the management of pests is evolving to include safer and more organic means in future I am sure. If you do want to tackle the wild parsnip on your own, I heard at the February 23 Business Breakfast that Indian Creek Orchard Gardens of Pakenham will be offering workshops on the proper removal of wild parsnip. The new Council was treated to a tour of the Mississippi Mills facilities on December 13. This included the Ramsay Garage, the Waste Water Treatment Plant, the wellheads by the Almonte Water Tower, the Almonte Day Care, both libraries, both arenas, both Fire Stations, and the Almonte Old Town Hall. Robert Kennedy was our Tour Guide. 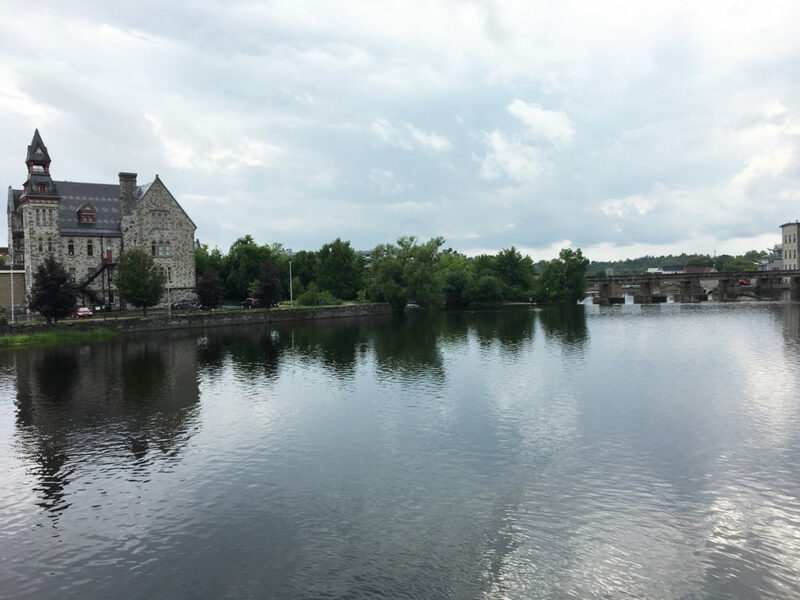 The water in Almonte is not fluoridated. I had thought it was . Although Health Canada recommends water flouridation for dental health, not all municipalities do so. Ottawa adds fluoride to the water it takes from the river. Fluoride occurs naturally in the earth and therefore in groundwater, but some parts of the world have too much (such as Utah, as I recall reading) and others not enough. Where the City of Ottawa gets its water via ground water from wells, such as around Carp, fluoride levels are naturally higher and they do not add fluoride. You may want to brush your teeth with a fluoride toothpaste more often. I learned the reason that some people taste more chlorine in their water: they are closer to the wellhead where it is added. To make sure that your water is safe to drink, chlorine is added to it at the well. Enough chlorine must be added so that it is effective at the farthest end of the water distribution system. Therefore, the closer you live to the wellhead, the more chlorine you are likely to detect in your water. While campaigning, some people told me that they thought there was too much chlorine in the water. I am a mid-distance away from my service well, so I don’t notice the taste as much, and wondered why some did. It is not their imagination. At the sewage treatment plant, only Councillor Holmes and I were brave enough to take a peek at the brown sludge being paddled in circles in big round bins. It had no odor, even up close. At the end of the tour, our guide lowered a mason jar on a hook into the treated outgoing water that was headed back into the Mississippi. He held it up for us to see: it was crystal clear. I notice that he didn’t drink from it, however! The weather varied a lot over the holidays, with a couple of days where freezing rain followed by snow made venturing outdoors difficult. I was sent a complaint that the roads were impassable: of course, by the time I opened the email, about 24 hours later, the sidewalks and roads were clear and I was personally able to walk across town with no problem. No one completely solved the problem but the Weather itself; while walking, I noticed that the sidewalks had been treated with salt. I also received a call about road drains blocked by ice, causing big puddles on streets. If the drain is blocked and the puddles freeze, the problems multiply. The piles of snow left by municipal and residential snow-clearing get pushed over these drains, with melting snow turning to ice on top of it all. With the weather up and down, it took a few days for municipal crews to attend to everything, but they did clear the drains of the ice blockages. I read in the news that shortages of sand and salt were predicted for this winter. Some municipalities were concerned about running out. This possibility means that, to conserve resources, your entire road might not be treated, but only the centre, so that at least two tires will grip and distribute the grains across more of the road. Conservation of increasingly expensive resources makes sense, especially with possible shortages and concerns about the effects of salt run-off. 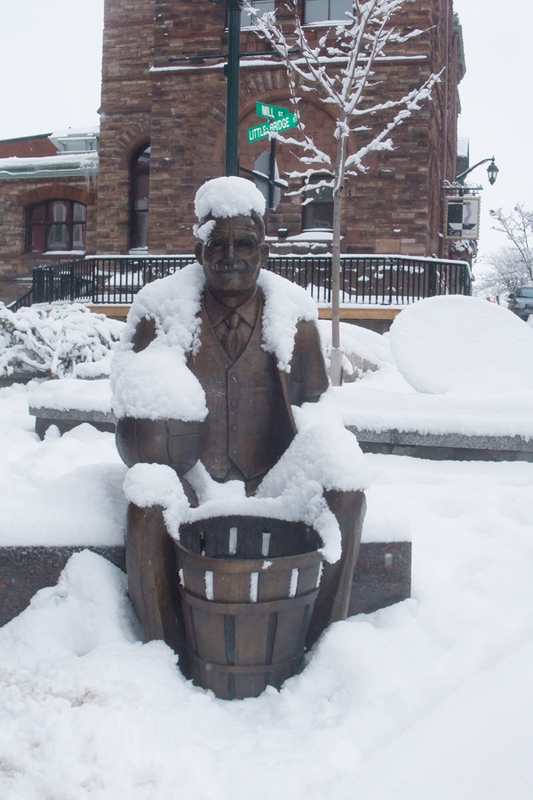 Did you know that Mayor Christa Lowry accepted an invitation to ride with plow operator Bruce Metcalfe? Her adventure began at 3 a.m. and she observed the meticulous work for 5 hours. She begs residents to PLEASE MOVE YOUR CAR OFF THE STREETS AT NIGHT. This greatly helps the snow removal crews. If you are concerned about specific road and sidewalk conditions, report this to the Municipality of Mississippi Mills by telephone to (613) 256-2064. Rod Cameron is our Operations Manager for Public Works. School patrols help children cross safely on less busy streets. The safety of children on their way to school has been raised by many people in Tait McKenzie, Holy Name of Mary and Naismith schools neighbourhoods. Several people there have told me that traffic is more congested in front of the schools because some parents, whose children are within walking distance of the school, drive the kids to avoid an unsafe street crossing at Ottawa Street. In some cities and towns, school routes are patrolled by the “school patrol,” older students who have been trained to help younger ones cross intersections safely. Their training is provided as a joint project by the province and the Canadian Automobile Association, in cooperation with schools. Paid or volunteer adult crossing guards are used on major streets. Parents are more willing to let their children use active transportation to school (walking or cycling or scooting) if there are crossing guards and school patrols. Some people say that the municipal paid crossing guard program in Almonte was discontinued because it was thought too expensive. Some say no one wanted to do it. Some say the schools should look after it. There are suggestions that the high school students might do it for their volunteer experience. There are kindly retirees in Almonte who might volunteer, too. I think that we can all work together on this. There are 40 school weeks. In Almonte, a crossing guard is most needed on busy Ottawa Street at Paterson, for elementary school children. To pay one crossing guard $15 per hour, for two hours a day, 5 days a week, for 40 weeks would cost $6,000. Two guards would cost $12,000. Additional insurance might be required. School patrols, who are older students who do not control traffic but rather ensure that children cross safely, could be stationed at less busy intersections on the routes. They are usually let out of school a bit early, given high-visibility vests and flags and work with a volunteer staff person or parent. People have suggested that high school students perform this function as part of their volunteer hours. I have communicated with both School Trustees and Councillor Dalgity. We are arranging a meeting to discuss this in January. We need to have safer school routes.